November | 2011 | WHAT A FEELING! Russell uncorks this bit of self-lampoonery knowing full well that most critics consider the director of Tommy and Altered States as “grossly indecent” a moviemaker as exists on the planet. But the dialogue certainly gets it right: Salome’s Last Dance is another cyclonic phantasmagoria from Russell’s feverish brain—an outrageous evening, indeed. I think it’s a minor film, when all is said and done, but it is at least mounted with high style and good humor (Russell’s previous movie, Gothic, seemed sour and hopeless). The Salome performance is given in a brothel on a November night in 1892. Wilde (played in a marvelously florid turn by Nickolas Grace) sits on a bower of pillows and watches his play unfold, and occasionally gets in on the peripheral action. 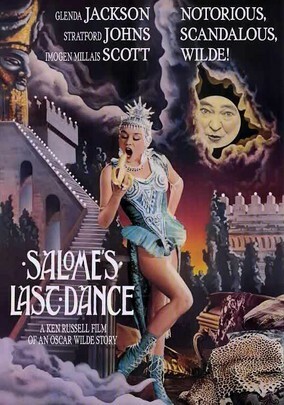 When Russell visited the recent screening of Salome’s Last Dance at the Seattle International Film Festival, he claimed that staging Wilde’s Salome in this manner was the only way to film the play without building elaborate, expensive sets. True, but there’s another, better reason. When Wilde watches his play staged, we see the way it reflects on his own life; he identifies himself as the play’s John the Baptist, and predicts himself betrayed by his homosexual lover just as John is betrayed by Salome. In the play, John the Baptist is played by Douglas Hodge; Herod by Stratford Johns; Queen Herodias by Glenda Jackson. The actors are ripe, as befits Russell’s scheme, and none is riper than Imogen Millais-Scott, the petite newcomer who plays Salome. Her lilting, breathy delivery is strange and haunting, and her amber eyes flicker with lust, particularly in the ornate temptations she offers the Baptist. What an exuberantly odd performance! Salome’s Last Dance might well have been a trashy, glitzy exercise in camp were it not for the tragic layer of Wilde’s own life, as suggested in sharp strokes by Russell. The movie may be crammed with gold-painted bodies, bare-breasted servant girls, dancing dwarfs, and a murderous banana peel, but with all of that, as is true of Russell’s best films, there’s more here than meets the eye. A maniac of the movies, Ken Russell died a couple of days ago. The man unleashed a few turkeys, but I can testify to the power of seeing Women in Love as a teenager, already aware of the film’s reputation as an Important Art Movie containing a certain raciness. The Eighties were not a great time for his films, although I am an Altered States fan, but this is a mad little item I somehow saw twice in its Seattle Film Festival and regular-run appearances. Between viewings someone told me that leading lady Imogen Millais-Scott was blind, which certainly gives an unusual dimension to watching the movie. But then all the actors are pitched in a slightly crazed, unreal mode, which seemed to suit Russell just fine. I also like Nickolas Grace; he played Anthony Blanche in the ’81 Brideshead Revisited miniseries, and he nailed the defining-devastating moment when he turns to old friend Charles Ryder to accurately confide that Ryder’s paintings are “tewwible twipe,” despite the fawning of art patrons. We’ve seen this set-up dozens of times before in the movies. You take a guy, and you establish that he’s got psychic powers. Fine. Now make him the pawn in a nefarious government plot to—oh, control the world, for instance. Trick him into helping an innocent-sounding research project, and then drag him into the nasty business. In just the last year, The Dead Zone, Brainstorm, and Firestarter have all used this serviceable plot line, more or less. Dreamscape joins the ranks. But like almost all movies about psychic characters, it conveniently avoids the question that always presents itself with this plot. If this guy’s so psychic, how come he can’t see the bad guys for what they are? Well, he just can’t, I guess. You’ve got to suspend disbelief a little—make that a lot—in Dreamscape, or you’ll never go along with it. You may not go along with it anyway. It’s about a man (Dennis Quaid) with the telepathic “gift,” who gets drafted into a project that will unlock the key to dreams. Some scientists (Max von Sydow and Kate Capshaw) have discovered a way to transport highly psychic people into the dreams of others, in the hope that the dreamer may be cured of whatever demons may be haunting him. Turns out the whole thing is a plot by a covert government group led by Christopher Plummer, who looks and talks like a National Security advisor. He practically is one; he’s an old buddy of the President of the United States (Eddie Albert), who has been having these nightmares lately. I don’t want to give everything away, but Plummer doesn’t agree with the president’s plan for nuclear disarmament, and would like to get him out of the picture. This coincides with the discovery that a dream-visitor can cause heart attacks in dreamers by terrifying them during a nightmare. So Plummer invites the president over the research center for a short nap…. About halfway through, I began to enjoy the movie anyway, in that lazy way yiou can get into the simplest potboiler that comes on TV late at night. Dreamscape has no pretensions, which makes it both disappointing and pretty palatable. It has no intelligence either, but it does have Kate Capshaw, in her third movie in as many months (the others were Indiana Jones and the Temple of Doom and Best Defense). I continue to find her an attractive actress, despite her bad luck with roles. And it’s got von Sydow and Plummer, who are silky-smooth. But then they could do this kind of thing in their sleep—which maybe they did. After all, everybody else in the film is asleep at one point or another. To top it all off, it has a human heart being ripped out of a chest, just like the one in Indiana Jones. Which means, of course, an automatic PG-13. Look, what can you expect from a director (Joseph Ruben) who began his career with The Pom Pom Girls? Still, look for Dreamscape on cable-TV in six months. You may very well enjoy it. Of course Ruben’s next movie was The Stepfather, an excellent picture, so I paid for that crack about the Pom Pom Girls. (Still, he was responsible for Gorp, so you can understand where I was coming from.) 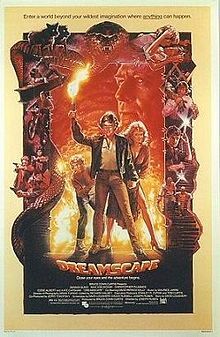 I’m not sure if Dreamscape is an actual cult movie, but it has its fans, and way back then I seem to recall Pauline Kael was one of them, which means the movie must still have fans amongst her followers. I would actually like to see this again, but apparently I’ve had other things to do in the past 27 years. The Philadelphia Experiment is a low-budget bit of nonsense that explores a well-trod sector of that vast region known as the Twilight Zone: time travel. 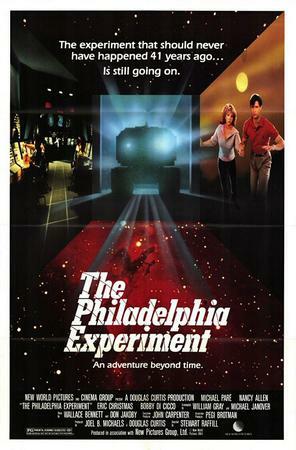 Like the “Time Tunnel” shows, the heroes of The Philadelphia Experiment are flipped around in the time warp thanks to a government experiment that goes wrong. In this case, a couple of sailors (Michael Paré and Bobby Di Cicco) are serving aboard a destroyer in Philadelphia Bay in 1943. Some hotshot scientists claim to have a device that will cloak U.S. ships from enemy radar, and they test it out on the ship with a full crew. Levers are pushed, and soon everybody on board is shaking and rattling and turning different shades of orange. The ship disappears from radar contact, all right—it also disappears from view. Yipes! The next thing we know, Paré and Di Cicco are tumbling through a tear in the space-time continuum (I don’t really know what that means, but it always sounds good when they say it in these movies—and they always do). They end up in the Nevada desert in 1984, where they are deposited because the government is once again trying the same test—won’t they ever learn?—and Paré and Di Cicco drop through a hole in the sky. They spend the next couple of days trying to go back, with the help of a woman (Nancy Allen) who doesn’t mind a little adventure. That hole in the sky is, of course, not the only hole in this plot. But, while this film is ragged and adolescent, it also has a sense of humor about itself. When Paré and Di Cicco wander about the desert, they pick up a bottle of beer: Lowenbrau. Good heavens—could the Germans have won the war? There are also humorous, if predictable, jokes about first encounters with television, punk rockers, and video games. The director, Stewart Raffill, bumps things along quite adroitly—and at times, with some delicacy. For instance, there’s a prologue in which we’re introduced to Di Cicco’s 1943 wife. Later, Paré shows up at her door—in 1984. He hasn’t changed—people who travel through time never do, as everyone knows—but she’s much older. Interesting situation, and poignantly handled. Raffill isn’t quite as sure with his actors. Paré, the chef-turned-star who was in Streets of Fire, still communicates almost nothing but lunkheadedness, but this is his best outing yet. Everyone else is logging time. Sometimes they look slightly embarrassed at the silly dialogue they have to mouth, but the tone is mostly earnest. John Carpenter, the director Halloween and other stylish suspense flicks, is executive producer. It’s always hard to know what that title means, but Carpenter is well-known as a lover of B-movies, those modest entertainments that used to fill out the bottom halves of double bills and sometimes upstage the nominal A-movie. With the decline of first-run double-billing, the B-movie has all but disappeared. Its value as a cheap breeding ground for new talent is missed. I find it comforting that Carpenter, Raffill, and cohorts have not yet given up the ship. This should have been a better, pulpier movie. That cast list is certainly of the Eighties, people who were on the way up and apparently destined to be stars, but yeah, never mind. Stewart Raffill had also done The Ice Pirates in ’84, a spoofy thing, and would turn to Mac and Me, which I do not forgive. Will find both reviews as soon as possible. “How much romance can one woman take?” asks the romance novelist Joan Wilder, at the opening of The Jewel of the Nile. 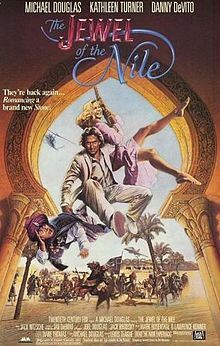 Joan (Kathleen Turner), you will remember, was the frumpy writer swept into the swashbuckling adventure of Romancing the Stone, a tale that might have sprung from the purply pages she regularly churns out. As Jewel begins, she’s in the South of France, having spent six months cruising the world and finding romance with he-man adventurer Jack Colton (Michael Douglas). But with all this romancing going on, she can’t find the time to finish her latest book, and her fling with Jack has gone a trifle stale. So, when she is approached by a bigshot Arab prince and asked to write his biography, she jumps at the chance, and abandons Jack for the prince’s palace. You win no prizes for guessing that the prince is not as he seems, and that something is rotten in the sheikdom—nor that Jack will soon be on his way to rescue Joan from this fine mess. That’s the basic skeleton of the story; it’s fleshed out with some amusing incidents along the way, including an escape in an F-16 fighter jet (neither Jack nor Joan know how to fly it) and a tribal wrestling match between Jack and a refrigerator-sized tribesman who wants to marry Joan. While some of these incidents are cute, the film as a whole lacks the fizz of Romancing the Stone. There’s a basic problem in structure: In Romancing, the transformation of Joan from dowdy novelist to stylish heroine was the real story, despite all the swashbuckling. In Jewel, there’s no such development, and the narrative seems oddly flat. The dry North African setting gets dull after a while, as does the sheik and his plan to take over the area. Also, the character of Joan is not as much fun as before—she seems dimmer, and has lost pluck. Lewis Teague’s direction is evocative; he comes from B-movies (Alligator and The Lady in Red both showed promise), and this is his shot at the big time. He choreographs the action well, especially the obligatory fight-on-top-of-a-train, which ends with a nice comic payoff. He’s also gotten a better performance from Michael Douglas, and a funnier performance from Danny DeVito, who repeats his role as a sawed-off scoundrel. DeVito has more one-liners than in Romancing, and he spits them out with unclean glee (surveying a wild Bedouin celebration dance, he nudges Jack and growls, “Looka this, Colton—no sheep is safe tonight”). But, as occasionally pleasant as the film is, I was left cold after it was over. By the time of the big climax, I was already a bit bored. Not only are the characters cardboard and the locale dull, the jewel of the Nile turns out not to be a jewel at all. Whatever happened to truth in advertising? Well, not a great review, although I suppose the point about the absence of actual character development goes to something about the movie’s failure to click. Not much to work with, anyway; the movie has the feel of a rushed, not-thought-out cash-in. My review of Romancing the Stone is here. In 1981, Steven Spielberg and George Lucas combined their already successful talents and invented a hero to match their memories of the great breakneck cliffhangers of the 1940s. His name was Indiana Jones (played so memorably by Harrison Ford), and the film was Raiders of the Lost Ark. Ah, you’ve heard of it. This mammoth hit was followed by Indiana Jones and the Temple of Doom, another smash. Now Lucas (as producer) and Spielberg (as director) have brought their hero back for a final go-round, Indiana Jones and the Last Crusade. As usual, the movie is constructed around a series of hair-raising stunts and chases. In this case, there’s a twist at the start: The curtain-raiser features not the mature Dr. Jones but an adolescent Indy (River Phoenix), a Boy Scout who stumbles across some tomb robbers and leads them on a merry chase when he snatches the artifact they’ve dug up (“This belongs in a museum!” shouts the serious lad). This sequence is a delight, as young Indy prances about on a speeding circus train; we learn how he came to fear snakes, adopt the Stetson, and even how he acquired the scar that graces Harrison Ford’s chin. It’s a wonderful sequence, and gets the film off to a rousing start. It also introduces the idea of Indy as someone’s son, which is taken up in more detail as we skip ahead to 1938. 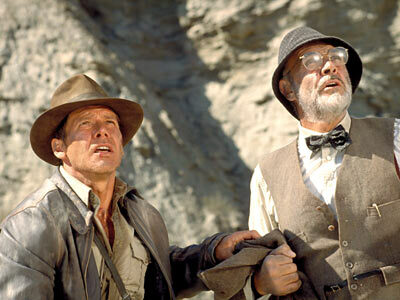 Dr. Jones, it seems, is the son of another Dr. Jones (Sean Connery), himself a great expert on ancient artifacts, and a somewhat distant father. But the elder Jones is in trouble. He has been searching for the Holy Grail, the most famous artifact in history, and he has vanished. Indy suspects some competing crusaders, such as the Nazis, may have kidnapped Dad when the location of the Grail was deduced. So the adventure of The Last Crusade is twofold: find the father, and find the Grail. The quest leads from the canals of Venice to an Austrian castle to the belly of a zeppelin to a mythical Middle Eastern country. For the details, you’ll have to see the movie. I’m not about to spoil the fun. In the most basic way, The Last Crusade delivers the goods, and a lot of it is exhilaratingly mounted by Spielberg (the script is credited to Jeffrey Boam). The production is lavish, Connery is just what one would hope, and there’s effective supporting work from Denholm Elliott and a newcomer named Alison Doody; she’s Indy’s girl. That said, the film still has an air of redundancy. The format is essentially unchanged from the previous films, and Spielberg and Lucas seem wary of breaking out of the thrill-a-minute rhythm. I’m surprised Spielberg hasn’t wrought more emotion out of the father-son relationship; it’s supposed to be a reconciliation, but it simply doesn’t pay off effectively. And I wonder whether Spielberg’s heart is in the boys’ adventure genre any more. He abandoned Rain Man in order to fulfill his Indy agreement with Lucas, and Spielberg has described The Last Crusade as his final film for the youth market. I suspect he has already moved on. So Spielberg didn’t entirely abandon the youth market, and it wasn’t even the last Indiana Jones movie. I recall Spielberg saying that the original conception was about a very shy, bookish father who was transformed by the adventure; but when they cast Connery, that idea became impossible, and the theme of the movie changed. But that original idea sounds better. Actually, Chase’s performance seems to contradict the title; he’s barely alive in the role. He’s lost some weight and he’s disciplined again, but he doesn’t appear terribly engaged by the material. Even the ostensibly wacky disguises that Fletch enjoys with regularity are given half-hearted interpretations. 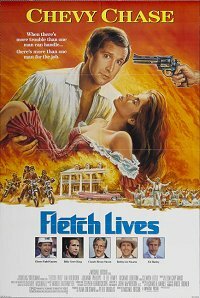 At the film’s opening, Fletch discovers he has inherited a plantation in Louisiana. He imagines a stately life for himself; perhaps he’ll raise chitlins. “Their fur is quite valuable,” he guesses. He quits his job in Los Angeles, and move to his new home. When the comely estate lawyer (Patricia Kalember) turns up murdered in his bed, there’s clearly a mystery to be solved. Eventually, it is solved, though the solution is surely indecipherable to any average audience member. I don’t have a clue as to what it was all about, except that it had something to do with a vulgar evangelist (R. Lee Ermey), his daughter (Julianne Phillips, Bruce Springsteen’s ex), a crackerbarrel lawyer (Hal Holbrook) who dresses up in Confederate Army uniforms, and a sharecropper (Cleavon Little). But then the mystery is just an excuse for Fletch’s different routines. Chase pretends to be an evangelist, whereby he heals a man’s migraines by slapping him violently in the forehead; he also impersonates a prissy Northerner named Harley, purported heir to the Harley-Davidson empire. The whole exercise seems so routine as to merely fulfill some contractual obligation. The ad campaign is much more inspired: a takeoff on the original Gone with the Wind poster, with Chase hunkered over a bodice-bursting Southern belle as Atlanta, or something, burns. Nothing’s on fire in Fletch Lives. It sounds like this should have been funnier than, apparently, I thought it was. This was a year after Funny Farm, which was a rare instance of Chevy Chase being involved in an actual movie that had some kind of life and for which he was uniquely suited (and, alas, it flopped); so in ’89, his career was about to lose its thread. Richard Chamberlain debuted as the swashbuckling adventurer Allan Quatermain in 1985’s King Solomon’s Mines, a spoofy version of the H. Rider Haggard classic as retooled for the post-Indiana Jones crowd. The world held its breath for the release of the promised sequel, which had in fact been filmed at the same time as Mines. Cannon Films kept scheduling the movie, then postponing it, perhaps hoping audiences would forget about the first film, a real stinker and a box-office dud. Now they’ve let the other shoe drop—a leaden jungle boot, by all appearances—and Allan Quatermain and the Lost City of Gold is upon us. It turns out that the sequel is a notch better than the first film, though that is a largely irrelevant distinction when comparing achievements this negligible. 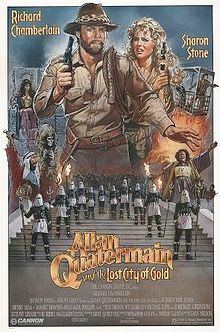 The opening of the movie finds Quatermain (Chamberlain) in Africa preparing to marry his honey (Sharon Stone) from the previous film when a man stumbles out of the jungle babbling a tale of a hidden city with streets paved with gold, populated by white natives (the latter a racial phenomenon that never is explained). Of course Quatermain must find the city, and of course his woman must tag and tease along. Screenwriter Gene Quintano and director Gary Nelson throw in broad assortment of complications in their path, including snakes, wormy beasts, collapsing floors (lots of those), cannibals, and a craven Indian holy man who looks, speaks and acts like Sam Jaffe in Gunga Din, and presumably has “comic relief” stitched across his forehead, which remains thankfully covered with a turban. Not much else to say, except that the film provides work for some fading character actors: Henry Silva doing his high-cheekboned ritual as the evil ruler of the Lost City, James Earl Jones embarrassingly relegated to wrestling with a lion, and the spectacularly built Cassandra Peterson (better known as “Elvira”) as the evil priestess, whose role has no dialogue until she exclaims “Oooh!” just before she is dropped into a vat of molten gold. Chamberlain, who is not comfortable as the bearer of wit, struggles as before. But he can relax, and return to his TV miniseries successes; no one is going to call on him to do this sort of thing again. Some strange careers came together for this dismal experience: director Nelson was a TV helmer with a huge list of credits, including, for the bigscreen, the first Freaky Friday and The Black Hole; screenwriter Quintano wrote and starred in the 3-D madness known as Comin’ at Ya! And, of course, Chamberlain, who really seemed like just absolutely the wrong guy to work on this, except you can’t really think of anyone who would’ve been the right guy to work on this. You are currently browsing the WHAT A FEELING! blog archives for November, 2011.